Canadian artist Von Wong has created a huge plastic sculpture made from reclaimed plastic, including 168,037 straws. The sculpture was used to raise awareness about single-use plastic pollution and the impact it’s having on the world’s oceans, with scientists predicting there will be more plastic than fish in the sea by 2050. Von Wong (Canada) and Zero Waste Saigon (Vietnam) organised the attempt in Ho Chi Minh City, Vietnam, on 22 January 2019 for the Largest drinking straw sculpture (supported).The attempt was also sponsored in part by Starbucks, who installed used straw collection bins at a number of their stores in Vietnam. 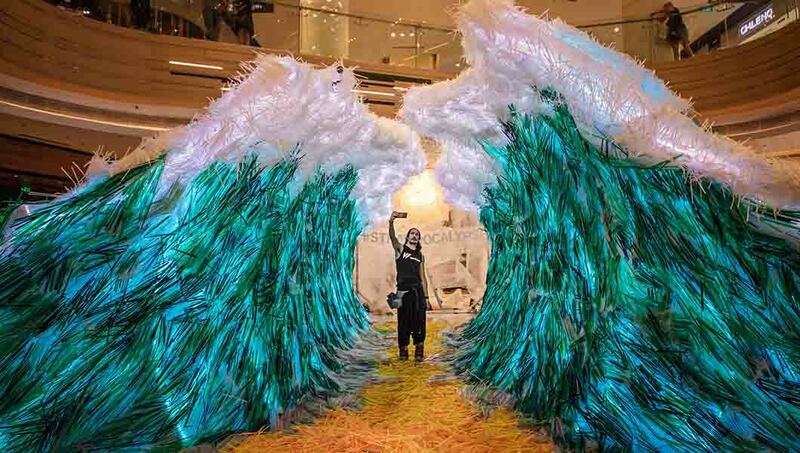 Over the course of 6 months, straws were collected from Starbucks and clean-up groups organized by Zero Waste Saigon across Vietnam.“The installation is meant to depict the parting of the plastic ocean in an attempt to engage and encourage individuals to say no to single-use plastics, especially straws,” explained artist Von Wong.The installation will stand for a period of approximately three months in Estella Place, Ho Chi Minh City, open for the general public to go and visit.